At Pain Physicians NY, the top pain management clinic in Brooklyn, NYC hip strain pain management doctors and specialists effectively treat all grades of hip strain pain. We are using the latest compression and electrical nerve stimulation devices for Grade I and II hip strain (swelling, bruising, stiffness, and muscle spasms). In case of Grade III, we might recommend surgery and subsequent physical therapy. We effectively treat acute and chronic hip strain pain in Brooklyn using the latest cutting edge advanced methods and techniques. A hip strain is usually not as severe as a hip fracture or break because it only affects the soft tissue in the hip area. The soft tissue is made of the ligaments that connect the bones together and ensure the joint movement in the desired angle. While hip strains may not be very serious, they can still be quite painful and cause a lot of discomfort. In addition, if left without proper care, the pain can spread to other uninfected areas and may even cause complete immobility. 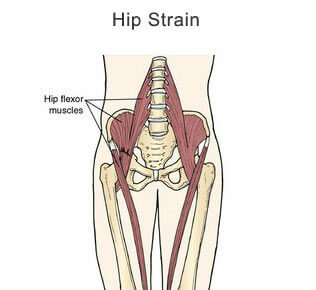 A hip strain is identified by pain experienced directly over the injured area that increases with increased activity. This pain is measured by the severity of the pain from grades I, II and III from mild moderate and severe. Depending on the severity of the pain, other signs and symptoms may occur as well including swelling, bruising, stiffness, and muscle spasms. Some people are at a greater risk suffering from a hip strain than others. Physical activity or sports without proper warm – up techniques. Hip strains can be acute and chronic. Acute hip strains are often due to an injury or trauma on the affected hip, characterized by acute pain. Chronic pain lasts longer and comes over the time, usually caused from an acute hip injury or strain which was not treated as needed, once the trauma occurred. Ligaments are responsible for keeping the joint in check by guiding the bones to move in a particular angle. Any attempt to overstretch the joint may cause damage to the ligaments and lead to a hip strain. Injury, too, such as a fall on the hip, may also cause a hip strain since it forces the joint to move in a weird direction, injuring the ligaments. Once you have experienced a hip strain, you should be careful when performing the same exercise because the ligament may not have completely healed. This is why those who have been previously injured may experience subsequent hip strains. Signs and Symptoms of Hip Strain? Limited range of motion, etc. How is a Hip Strain Diagnosed? If you experience any of the symptoms above and home remedies such as over-the-counter medications, ice and rest don’t seem to work, you may need to see a healthcare professional. They will perform the examination by requesting particular movements of the leg and applying pressure to the affected area. All these are to determine the particular region of the hip affected and to determine the severity of the injury. If the injury is determined to be severe, the doctor may request X-rays in order to rule out any hip fractures. An MRI may also be carried out to get a better view of the ligaments and assess their extent of damage, although this is not commonly performed. Grades I and II: this means that the ligaments may be swollen or bruised, but they will recover with time. Treatment in this case usually involves bed rest, ice packs, massage, and slight compression and elevation of the legs. The idea here is to limit the physical activity but also to provide enough stimulation to the ligament for a faster recovery. Sometimes, crutches may be advised, but this is not often used. Grade III: this is where the ligaments may be completely torn and this would typically require surgery and subsequent physical therapy. How is a Hip Strain Managed? Acute and chronic hip strain pain management doctors and specialists at Pain Physicians NY (Brooklyn & NYC) offer individualized approach, the most effective hip strain treatment options utilizing the latest technologies available in USA. The pace at which technology is growing can make last year’s methods obsolete. Our team is always at the top of their game and at the head of the pack.